2015: Devolution. Federation. Constitution. From here to where? 2013: The Relationship Between the ECHR and National Constitutional Courts? 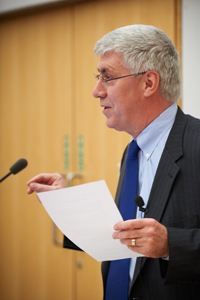 On Friday 6th May 2011 the Centre for Public Law held the eleventh in the series of lectures in honour of Sir David Williams. The lecture, entitled "The Rule of Law and Human Dignity" was given by Professor Jeremy Waldron. Separate pages containing photographs, video, and audio recordings of the lecture are available here. "Boundaries of Rights: The State, Private Actors and Positive Obligations"
The conference brought together participants from Harvard , Toronto, Luxembourg, Geneva, Tel Aviv , NYU , Oxford , Queens' University, and Cambridge. Speakers in the conference addressed the topic from perspectives of constitutional law, private law, international law and legal theory. "Assessing the Impact: the Zahid Mubarek Inquiry - Five Years On"
Have there been significant reforms to the prison systems to make it safer, more racially and religiously tolerant and humane? What are the next steps? This one-day conference examined the impact of the Zahid Mubarek Inquiry into the prison system, five years on. Professor Eric Barendt (UCL) gave a talk entitled "Meaning in Media Law (with particular reference to Defamation Law)". The talk took place at the Law Faculty, Tuesday 15th March 2011. Dr Nicole Moreham (Victoria University of Wellington, New Zealand) gave a talk on "Physical privacy". The talk took place at the Law Faculty, Wednesday 25th May 2011. Dr Alison Young (University of Oxford) gave a talk on "Deference and Disagreement". The talk took place at the Law Faculty, Thursday 2nd June 2011. Professor James Weinstein (Arizona State University) gave a talk on "Holocaust Denial and Free Speech". The talk took place at the Law Faculty, Wednesday 8th June 2011. David Mead (UEA) gave a talk for the Centre on "The New Law of Peaceful Protest". The talk took place at the Law Faculty, Wednesday 16th February 2011.